When it comes to traveling China, the first thing you'll need to do when you arrive is to exchange your U.S. dollars for its equivalent value in Chinese money. The currency in China is called the Renminbi or Chinese yuan (CYN), and changing your money into CYN is a relatively simple process. There are several places you can exchange currency in China, including the airport, some major hotels, most local banks, and even a few exchange kiosks and booths that are popping up in cities across the country. However, it's easier to exchange cash directly in China rather than via a traveler's check or credit card, so it's important that you plan ahead and bring enough cash with you as it may be hard to withdraw American dollars once you arrive. You should also keep all of your exchange receipts and make sure you elect to receive one if you use an ATM to get money. If you plan to change any Chinese currency into another currency at the end of your trip, you'll need the receipt to do this. If you don't have the receipt, the exchange counter will refuse to change your money from CYN. While there are a number of locations to exchange foreign currency in China, the most convenient option for travelers is to go to an exchange counter at the airport when they arrive in the country. These counters typically accept both cash and travelers' checks and charge a nominal fee for the transaction, but otherwise have the same exchange rate as any other method. However, you can also exchange U.S. dollars for CYN at banks in large cities as well as at many local hotels. Although both offer the same exchange rate, the hotel will likely charge more for the transaction. Additionally, only large branches of banks will offer foreign exchange, but there will typically be English-language signage (as well as Chinese) for banks offering this service. A relatively new place to exchange your money in China is the exchange kiosks and booths that have started to appear in major cities across the country. While these kiosks aren't ubiquitous by any means, more and more exchange kiosks pop up in Shanghai every year. These kiosks look like ATMs but have a big English sign that says "Exchange," making them easy to identify and use on the go. No matter which location you choose to exchange your money, you'll want to make sure you do so before you head into the countryside to visit smaller towns. You might not be able to find a bank with a foreign exchange counter easily outside major Chinese cities, so you should make sure you have enough CYN before you leave the city. Additionally, cash is much easier to exchange than a traveler's check as banks in China can and will refuse service to customers if they don't want to verify the validity of the check. 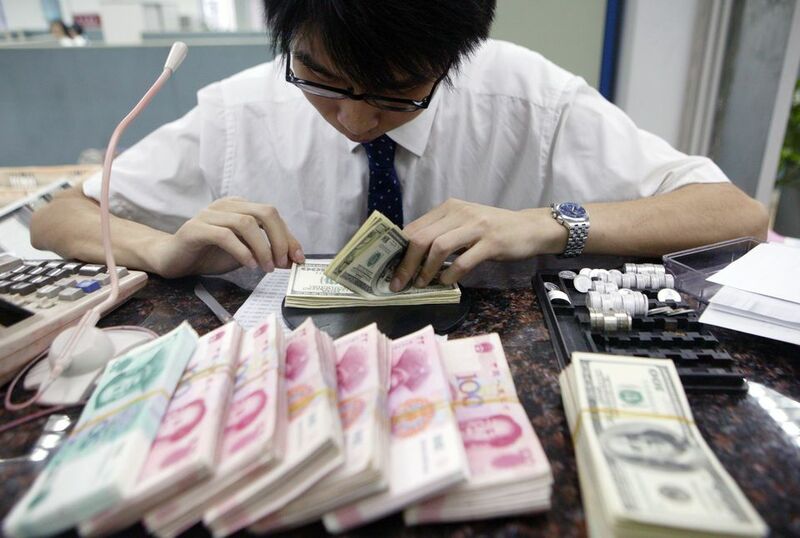 On the other hand, Chinese bank tellers will always accept and exchange U.S. cash for Chinese yuan, even if they aren't having a particularly good day with tourists. In order to appropriately budget for your trip, you should plan how much money you will need each day of your travels and bring the appropriate amount of cash with you to exchange—which can also be done in the United States before you depart. Most Chinese travel websites recommend 2,000 CYN per day if you're traveling alone (to account for accommodations, three meals, transportation, and any incidental costs), which amounts to about $300. As China rapidly modernizes, other payment methods have become possible for international travelers including using debit cards at local ATMs and various mobile payment methods like AliPay and WeChat. You can typically draw out money from ATMs in major cities (and even some smaller towns), but you should consult with your United States banking institution before you travel to assess the applicable fees and your eligibility to withdraw money abroad. While perhaps a little more expensive that withdrawing money from a bank, the convenience of using ATMs makes the transaction worth the added cost. When making purchases at stores, you can almost always pay with WeChat or Alipay, but neither of these apps currently support foreign credit or debit card transactions, so you'll need to get a Chinese card in order to use them. On the other hand, Apple Pay is used in China, but it is only accepted at a limited number of retailers in the country.